Principles of HVAC in Buildings by J. W. Mitchell and J. E. Braun provides foundational knowledge for the behavior and analysis of HVAC systems and related devices. The emphasis is on the application of engineering principles, and features a tight integration of physical descriptions with a software program that allows performance to be directly calculated, with results that provide insight into actual behavior. The examples, end-of-chapter problems, and design projects are more than exercises; they represent situations that an engineer might face in practice and are selected to illustrate the complex and integrated nature of an HVAC system or piece of equipment. Coverage of material applicable to the field is broad: a Fundamentals section on thermodynamics, fluid flow, heat transfer, and psychrometrics; types of HVAC systems and components; comfort and air quality criteria; a Loads section on weather data processing; design heating and cooling loads; an Equipment section on air and water distribution systems, heating and cooling coils, cooling towers, refrigeration equipment, and a Design and Control section on seasonal energy use, control techniques, supervisory control, the HVAC design process, and the rules of thumb often used in design. 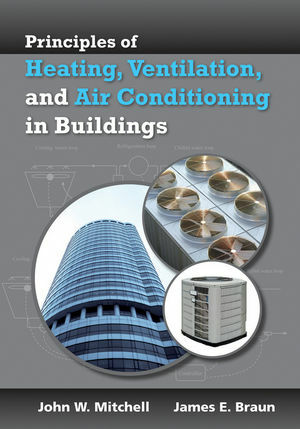 The textbook provides a foundation for students and practicing engineers to design HVAC systems for buildings. In addition, there is extensive supplemental on-line material that provides more in-depth and comprehensive treatment of equipment and component modeling and performance that is geared towards current and future equipment design engineers. John Mitchell is an emeritus professor at the University of Wisconsin, Madison. He received his Ph.D from Stanford University.He is currently working with Wiley on a Thermal Sciences concept inventory project. James Braun is a professor of Mechanical Engineering at Purdue. He received his Ph.D from the University of Wisconsin in 1988. HVAC is his primary research area. 1.2 History of air conditioning. Application of fundamental principles to develop performance relations for HVAC systems and equipment that provides insight and understanding of actual behavior. Broad coverage of loads, systems, and equipment that prepares students for careers in many varied aspects of the HVAC field. Realistic design examples and problems that reflect current engineering practice. Examples and problem solutions implemented with an interpretive language equation solver (EES) that allows students to focus on physical descriptions and results.